The Resignation category contains all the articles and reports regarding the resignation of the Emeritus Pope Benedict XVI. on February 28, 2013. The pontificate of Pope Benedict XVI. has come to an end. The period of the Sede Vacante (“empty chair”) has officially begun on Thursday 8:00 p.m., and ends with the election of a new Pope. At exactly 8:00 pm, the door of the Papal summer residence in Castel Gandolfo, 30 kilometres south of Rome, whereto Benedict had retired on Friday, was closed. Benedict XVI. is now an Emeritus Pope. The Swiss Guard withdrew from Castel Gandolfo. Their mission is to protect the reigning Pope. At the same time the Cardinal Chamberlain (Camerlengo) of the Roman Church, Cardinal Secretary of State Tarcisio Bertone (78), sealed Benedict XVI’s apartment, on the third floor of the Apostolic Palace in the Vatican, and the elevator that leads there. It is the same ceremony as after the death of a Pope. The rooms remain closed until the election of a successor. Also Benedict’s fisherman’s ring has no function anymore. Benedict is the first Pope of modern times who resigned from his post.It has yet not been determined When his successor will be chosen. In many countries, there where held commemoration services, for the farewell of the Pope. At 8:00 pm, the portal of the residence was closed as a symbolic sign of the end of the pontificate. 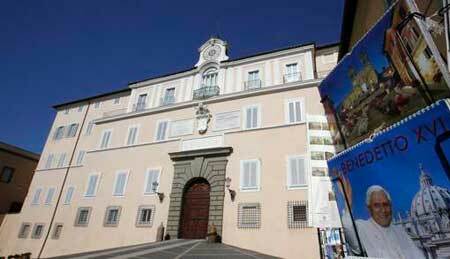 Once again there were “Viva il Papa” calls and all bells were rung in Castel Gandolfo. 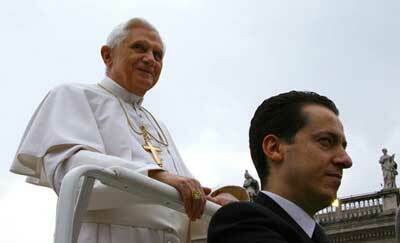 Vatican insiders wonder whether the scandal surrounding the unfaithful butler Paolo Gabriele has moved Benedict XVI. to resign. Many questions remain unanswered after the “Vatileaks” affair. According to journalists and Pope biographer Peter Seewald, the “Vatileaks” affair was not the reason for Benedict XVI’s resignation. The betrayal of his long-time servant Paolo Gabriele had neither thrown the Pope off track, nor tired of office, Seewald reported after a conversation with Benedict XVI. at the summer residence in Castel Gandolfo last August. BBut the case of the stolen papal documents that have partly publicly accessible, is one of the most spectacular scandals in the entire history of the Vatican. So far, there has never been faced a that close collaborator of the Pope with such serious allegations. Therefore it cannot be ruled out, that the bitterness in consequence of the scandal, as well as the factional infighting among the Cardinals in the Curia have encouraged the Pope in his decision to resign. 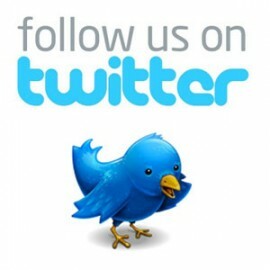 On Thursday the Italian newspaper “La Repubblica” wrote, that some Cardinals might be susceptible to blackmail, referring to a secret report regarding the “Vatileaks” affair, that three Cardinals had presented to the Pope on December 17 2012. The report of the three-member Cardinal Commission about the scandal continues to be officially kept secret. Therefore it is still not known through which of the many duplicate letters and reports the Pope might have been susceptible to blackmail. Further there are circulating speculations, that the Italian intelligence service had obtained the material. After the imposition of a mild 18-month prison sentence against Gabriele and his pardon before Christmas, there remain many unanswered questions about possible accomplices and the motives that may have led the 46-year-olds to the systematic theft of confidential documents of the Pope. The former Valet of the Pope, Paolo Gabriele, who is been convicted of document theft to 18 months imprisonment, then pardoned, is committed to silence. The Italian news agency ANSA reported, the 46 Gabriele has signed a document in which he committed to the confidentiality of all the information from his time in the service of Pope Benedict XVI. The document was written by the lawyers of the Vatican. Even after the pardon Benedict had kept in touch with Gabriele. He had him and his family “proven interest and paternal closeness” it says from Vatican sources. Gabriele has started to work this week as a clerk in the Vatican’s Children’s Hospital “Bambino Gesu”, a hospital in the Trastevere district of San Paolo. The Pope had pardoned Gabriele on December 23. Thereupon he was allowed to leave the cell where he was detained since the conviction in October. Gabriele was convicted on October 6 by a Vatican Court, because he had copied confidential documents in the so-called „Vatileaks“ affair and passed on to the journalist Gianluigi Nuzzi. Nuzzi published them in his exposé. According to investigations, Gabriele sent Nuzzi numerous copied letters and secret documents from the home of the Pope. When the documents were published, observers speculated intra Vatican infighting had been the real cause of the breach of trust, one of the targets was Cardinal Secretary of State Tarcisio Bertone. Nuzzis book had made worldwide headlines in the past few months. 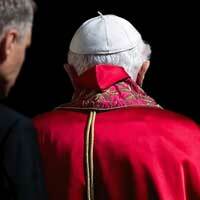 It is not just a resignation from office, but a retreat from the public: Pope Benedict XVI. wants to live isolated in the future and hide from the world. The 85-year-old said when meeting with Roman priests. The people celebrated the Pope at the Ash Wednesday Mass in St. Peter’s Basilica, as it was their last opportunity to pay public tribute to him. You could be right, it might have been one of his last appearances in public. In an meeting with the priests of the Diocese of Rome, where he serves as bishop, he said: “Even though I will retire in prayer, I will be close to you all, and you will be close to me – even if I will hide from this world. Benedict VXI. had previously been welcomed with warm applause by the Roman priests in the Vatican audience hall. “Thank you, thank you for your affection, for the great love for the Pope,” he said. The conversation with the clergy took about an hour. The head of the church wanted to respond to questions from the parishes of his diocese. The date for the meeting was fixed quite some time ago and had nothing to do with the announced resignation of Benedict on Monday. The Italian newspaper “La Stampa” reported, however, the Pope is said to have come to a final decision to resign during a trip to Mexico and Cuba. Pope Benedict XVI. is only the second pope, who is retiring in about two millennia of Church history. Coelestin V. had previously resigned in 1294, after only a few months in office voluntarily. He died in captivity in 1296 . However, before Pope Benedict XVI there is known only one voluntary resignation. Pope Coelestin V. left office Voluntarily on December 13 1294 after only five months. He was overwhelmed. Church historians speak of an unprepared and uneducated hermit who could barely speak Latin. The Cardinals had just elected him pope, because in nearly two years of struggle they could not agree on another competent candidate. Coelestin retired to a monastery after resigning.